Last week, I showed you how to remove veneer from wood furniture on this desk. I have been looking for a desk for basically forever and I was super excited to find this one on craigslist. The ad was by a family that lived like 45 minutes away but they met me half way to pick it up! Yay! This is how it looked when I got it home. It came with a matching chair too! 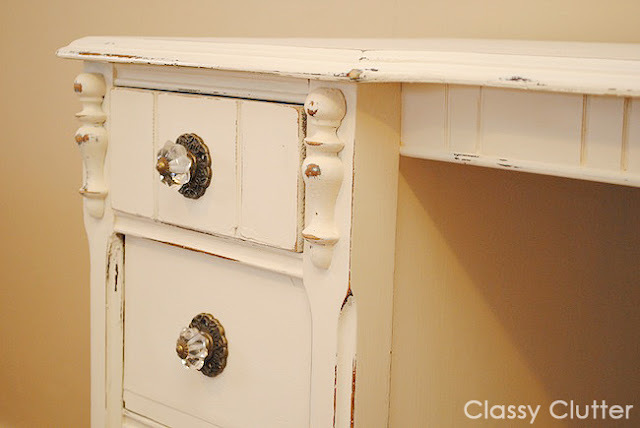 I made some DIY chalk paint in Glidden antique beige. I painted it and distressed it with a fine grit sanding block. Then, I used Minwax paste finishing wax for the first time and I must say, I’m in love with how easy it is to use and how smooth and soft the finish is. Seriously, I’m shocked it took me so long to try out wax! This was also my 2nd time using chalk paint and let’s just say skipping the sanding and priming step is awesome! I’m hooked! I got the knobs from Hobby Lobby when they were 50% off. I love crystal knobs and these ones had the antique bronze applique and decorative screw so I knew they’d be perfect! The detail on this piece is just perfect! The carved appliques and the legs drew me in. 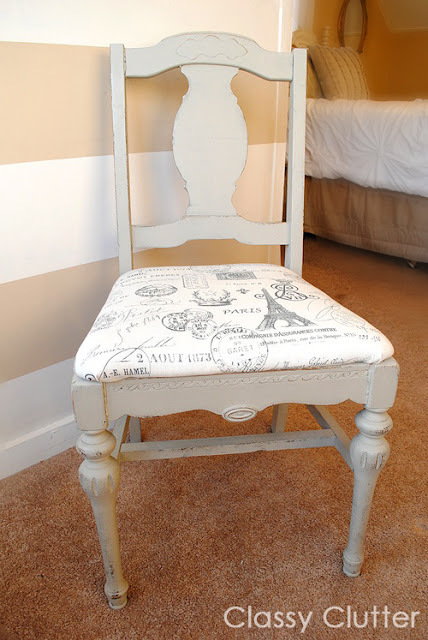 For the chair, I painted it with DIY Chalk Paint Recipe using GliddenOlivewood and finished it withMinwax Paste Finishing wax. I really like the look of the mismatched paint but matching style. I also picked up this French Script fabric from Hobby Lobby. I reupholstered it using this method and reattached the seat cushion. 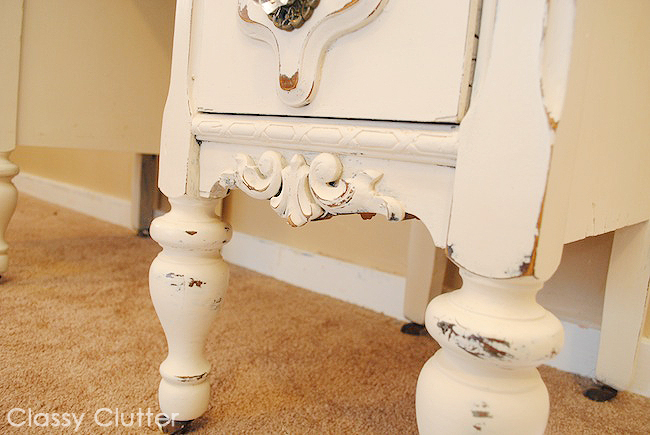 Have you tried a DIY Chalk paint recipe yet? What about waxing? Are you a fan? What a gorgeous desk!! I like how the paint treatment brings out all of the textured details. Well done! I love it! DIY chalk paint is the only thing I use! It is so much easier to use! What is your recipe? That is one beautiful desk, love the two colors that you used! I’ve used both, the ASCP and the homemade and like them both. The ASCP is smoother though! LOVE all the detail on the desk. And great job on the transformation! Mallory! Its gorgeous!!!! Love it so much. I’m glad you tried the minwax. I’ve wanted try it on a table and now maybe I will! You’re such an inspiration!! Why do you need to use a wax on painted furniture? Is it for protective purposes? Just wondering. I never used it before.The desk is beautiful. Why do people give this stuff away? 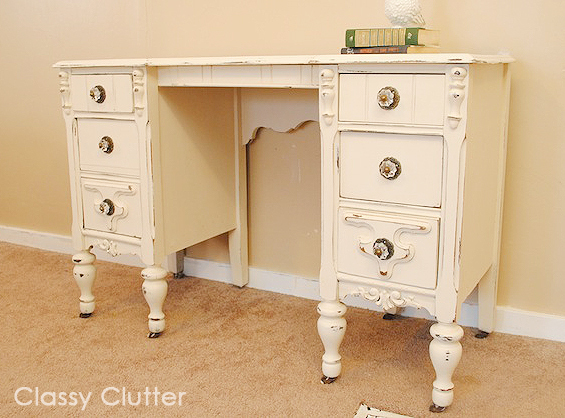 Thank you for sharing your chalk paint recipe. I have used it on two items at a fraction the cost. 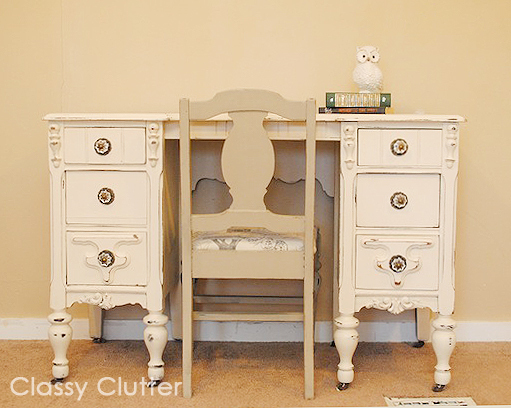 I love the antique white color. That looks AMAZING. What recipe did YOU use for the chalk paint? I love how it turned out… I think my favorite part is the different colors you used. Genius! Such a great makeover! The desk and chair look awesome! I think it was beautiful before with the old wood. The white chalk is cute, but I prefer the authentic. To each her own! I love the knobs, though! I loved the wood too but it was veneer and in really really awful shape. Peeling and chipping everywhere! I love the white too so I’m glad I was able to give it another life when the previous owners wanted to get rid of it. Thanks for stopping by! And those drawer pulls are super cute… What a great find! That turned out beautiful!! I also am a huge fan of Minwax Finishing wax – I use it on all my projects!! Beautiful Look for desk and chairs with nice makeover. what a creativity! really great work.looking amazing……. Thanks for sharing Very classic and unique chairs design. It is look like a old furniture but is really very nice chairs and table. I love how the desk turned out! It looks great and completely different! We did something similar to an old desk. It kind of looked like yours at first but we went with a more funky orange color. 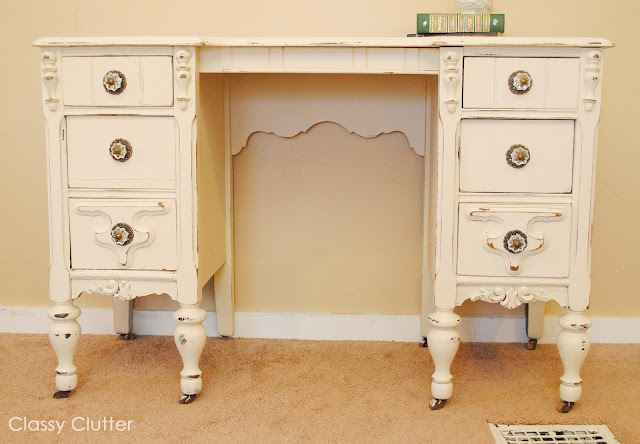 Check it out: http://www.homeownershiptips.com/2013/05/02/how-to-refinish-repaint-a-desk/. Hey, just curious… did you only remove the top veneer? or did you remove the veneer from the drawers too? How did you do that? Are you allowed to paint over veneer? Gorgeous!!! And I LOVE the drawer pulls! Came across this blog while googling “how to remove veneer”. I read that you make your own chalk paint. I’m curious. Can you post the recipe here? 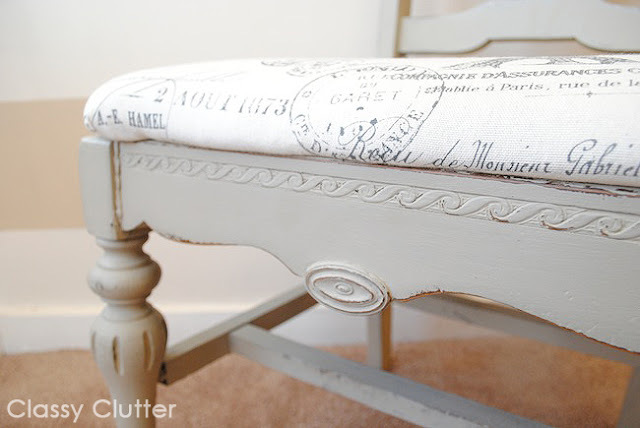 Also, in case you’ve never tried it, Annie Sloan Chalk Paint is my absolute favorite chalk paint! Although it’s only available in certain colors, there are lots & lots of different color combination recipes to create your own color. A quart is $38, but a sample is $13. So, if you wanted a color combo that required 3 colors, I usually buy the quart for the main color, and sample size colors for the other colors in the combo. And you can always use your leftover colors on other projects. Just make sure to mix the combination in a separate container instead of your quart can, so you still have 3 separate Colors left over instead of just your custom color leftover. As far as the AS Wax goes, even with clear wax, I always apply with lint free cloth and rub in the direction of the wood grain. Even though it’s clear, if you go with the grain, you shouldn’t ever see streaks. I NEVER apply in a circular motion! As far as the AS dark wax, it’s best to apply with an AS wax brush. If using dark, it’s well worth the money. Start with VERY LITTLE on TIP of wax brush, & again, go with the grain. Let sit for about 10 seconds, then wipe. Add more if you desire. But if you leave the dark wax on longer than about 10 secs, it will dry exactly how it looks painted on. The key is to always apply dark wax in small areas at a time with very little wax on brush, and wipe before going on to the next section. IF you unintentionally have more dark wax on your piece than you want, the great thing about ANNIE SLOAN’s wax is, you can just add a little more clear wax to the darker area, & it almost acts as an eraser for the dark wax. You can do this on the entire piece, or just a section that’s too dark. Then, reapply dark wax again to your liking. You really CANNOT mess up with ANNIE SLOAN’s paints & waxes!!! Would love to try your homemade paint, but after experimenting with several different brands, all I will use now, & have for awhile now, is the Annie Sloan. Good luck with future painting! I’ve enjoyed seeing the pieces you’ve done so far! Beautiful. What did you do to the top after the veneer was removed? Sad… am I the only human being left who loves natural wood versus paint? It was so gorgeous before. With the veneer off I would have painted only the top. We love natural wood too! In this case we loved the furniture piece but it needed a remodel! Thanks for stopping by! and bought 4 solid wood legs about 6″s each and had stained all 4 with a dark cherry stain and had put them on the otum…. NOW the otum looks very exciting and expensive and I didn’t mind buying the legs for them either. Good I’m glad! I always love a great find! What is your recipe for chalk paint? This piece is gorgeous! I’m purchasing a piece very similar but without the beautiful carvings on the 1st. With alot of luck I hope it turns out half as nice! Did you use clear wax? beautiful! what is your chalk paint recipe? i have never maid homemade and would love to! Hi! I’m so glad I stumbled across your tutorial for how to remove veneer without all the hassle. I am redoing a vintage executive desk and I’ve been trying to decide whether or not to remove the top or just fill it in and paint over. Now I know that I have some options. Thanks. I’m just curious how you refinished your top after you removed the veneer? Did you just Sam’s and then paint over it? Would love to know! Thanks so much for sharing your craft! I sanded it smooth and used chalk paint and clear wax! So glad you posted this. I love how everything turned out! I am really excited to try this. I bought some old wooden auditorium seats and the veneer on the seats is coming up. My problem is that once I get the veneer up, I don’t want to paint the seats (and I don’t think my husband would let me if I did). He’s a total traditionalist. So I guess I could re-apply veneer. I wondered what other words of wisdom – or caution – you might have.